Glendale Glitter N Glow Event. arizonahotairballoons.com is a proud sponsor. A Glendale Arizona Balloon Ride is an amazing way to see the area. It is also the home town of the Glendale Glitters n Glow! We have included some interesting background about the town below. When arranging your Glendale Arizona Balloon Ride, be sure to check our directions page to see how convenient we are to the entire valley. You can also come see at at the annual Glendale Glitter and Glow! Seeing Arizona Hot Air Balloons at the Glendale Glitters and Glow is always a opportunity to come out and see us. 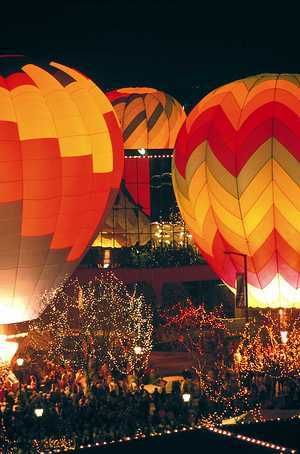 The Glendale AZ street filled will millions of lights and glowing Arizona Hot Air Balloons. Glendale is just another place you can see AZ Hot Air Balloons. Join us for a Glendale AZ Balloon Ride! In the late 1800’s what is now known as Glendale, Arizona, was all desert. William John Murphy, a native of New Hartford, New York who resided in the town of Flagstaff in what was then known as the territory of Arizona, was in charge of building a 40-mile long Arizona Canal from Granite Reef to New River for the Arizona Canal Company. He completed the canal, which would bring water to the desert land, in 1885. Murphy was deep in debt, since he had agreed to be paid in Arizona Canal Company stock and bonds and land instead of cash. In 1887, Murphy formed the Arizona Improvement Company. His objective was to sell the land and water rights south of the canal. Murphy had to raise capital from out of state sources in order to meet payroll and construction expenses. Murphy decided to refer to this land as “Glendale”. In order to develop and interest potential investors and settlers in this new town, Murphy decided to provide a better way of access from Phoenix to Glendale and ending in the town of Peoria by building an 18 mile long diagonal road which he named Grand Avenue. In 1891, Burgess Hadsell worked with Murphy to bring 70 Brethren and River Brethren families to Glendale to form a temperance colony. Soon settlers, attracted by the town’s ban on alcoholic beverages, continued to arrive. In 1895, Murphy platted the original town site and amended the plat to include a town park and some business lots. It was bounded by Lamar Road on the south, 55th Avenue on the east, Myrtle Avenue on the north, and 59th Avenue on the west. The construction of a railroad from Prescott to Phoenix was made possible with an exchange of the right-of-way made by Murphy along Grand Avenue. The railroad allowed Glendale settlers to transport goods to the north and easily receive building materials. The construction and commercial applications of the Beet Sugar Factory in 1906, also contributed to the growth of Glendale. Though the operations of the factory only lasted until 1913, it played an important role in the increase of immigrant and migrant settlers in the city. Glendale is the home to the Arizona Cardinals of the National Football Conference (NFL). The team formerly played at Sun Devil Stadium on the campus of Arizona State University in nearby Tempe, and in 2006 began playing at University of Phoenix Stadium. Designed by renowned architect Ron Elsensohn, the stadium was featured on The History Channel TV series, Modern Marvels because of its roll-out natural grass field. The stadium hosted Super Bowl XLII in 2008. Almost 1 year later on January 18 2009, it hosted the NFC Championship Game as the Arizona Cardinals defeated the Philadelphia Eagles 32-25 for the franchise’s first ever Super Bowl berth. This was the same year the Arizona Cardinals made franchise history and went to the super bowl. Gila River Arena (formerly Glendale Arena and Jobing Arena) is adjacent to University of Phoenix Stadium, and is the home of the Phoenix Coyotes of the National Hockey League (NHL), as well as the Arizona Sting of the National Lacrosse League (NLL). In 2009, the Los Angeles Dodgers and the Chicago White Sox are scheduled to share a new spring training complex and stadium in Glendale. Take a Glendale Arizona Balloon Ride and grab a game that evening. The memories are endless.